President Abdulla Yameen Abdul Gayoom has officially inaugurated the harbor developed in K. Thulusdhoo by the Maldivian government. 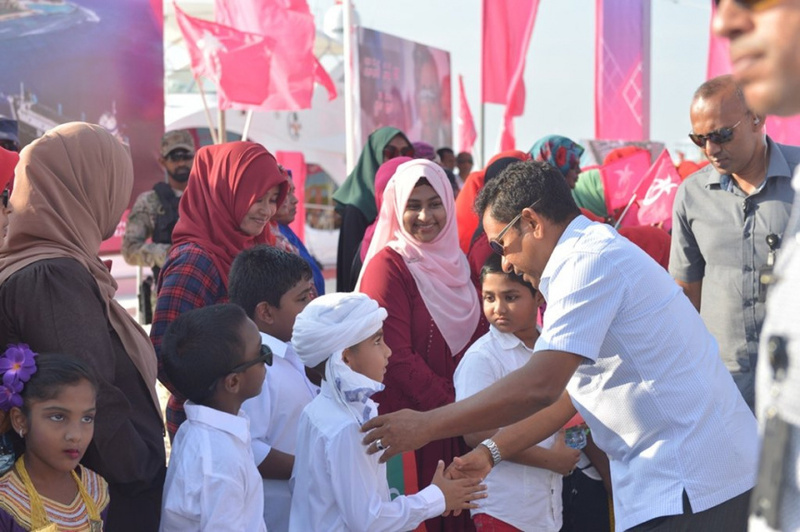 Yameen inaugurated the harbor in a function held at Thulusdhoo this Sunday morning. Thulusdhoo was the first stop in Yameen’s tour of three islands in K. Atoll. The USD 2.6 million (over MVR 40 million) project was contracted to Senok Trade Combine Ltd. Of Sri Lanka in November, 2015. The project was partly funded via loan assistance from Islamic Development Bank (IDB), and the rest from the State budget. The harbor stretches 800 feet in length and 300 feet in width. The harbor also has a 110-meter revetment and 290-meter outer seawall. Yameen is next scheduled to visit K. Maafushi and K. Guraidhoo. He is escorted in the trip by Minister of Housing and Infrastructure, Dr. Mohamed Muizzu, Minister of Environment, Tariq Ibrahim, deputy leader of ruling Progressive Party of Maldives (PPM) – Fonadhoo MP Abdul Raheem Abdulla (Adhurey) and several parliamentarians.